The Grand River Unitarian Social Action Committee has just organized a fantastic lecture opportunity from Dr. Sailesh Rao. 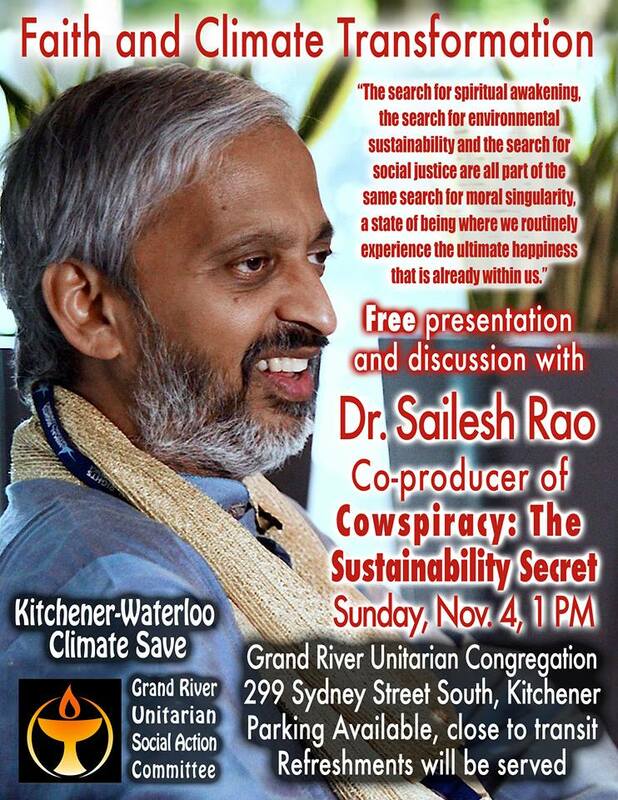 He is making a presentation at the Parliament of World’s Religions and has agreed to speak to us at our church in Kitchener on Sunday, November 4th, 2018. He has presented at all the major Climate summits, including the Paris Accord and once worked with Al Gore. Being frustrated that no one was talking about the REAL causes of climate change he co-produced three films, including Cowspiracy and What the Health. The search for spiritual awakening, the search for environmental sustainability and the search for social justice are all part of the same search for moral singularity, a state of being where we routinely experience the ultimate happiness that is already within us.